I guess it never ends with me. I was reading a thread on another forum where they were discussing the old PV Bandit 65. I had one or two thru the years and always liked them. So, naturally I went to the GC website and found one in good shape USED for $99. What ? $99 !!!!! Please take my money ! I'm talkin' $99 here ! So it arrives yesterday , no blemishes, overall very good shape, stock Scorpion 12" speaker. I plug it in and yep, just like I remembered, it sounds like a small N400 with the Steel and the clean/drive with the Telecaster is pretty darn nice, for me. 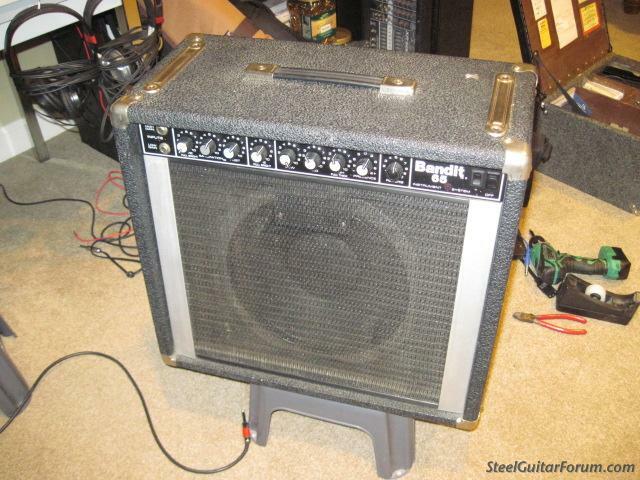 This is a very Steel friendly amp at low to moderate volume. Also, very Telecaster friendly. Today it gets a full bath, tomorrow it comes to my regular rotation bi-weekly Thursday gig. I did read on the PV website that this amp is 65 watts 8 ohms, 50 watts 4 ohms , 40 watts 16 ohms, which means I can add an external speaker with no issues as the Scorpion is an 8 ohm speaker. There is no ext speaker plug so I'll add one. I'm guessing the amp weighs about 40 pounds. yeh I know, I just did a thread on the DV Mark II. Don't worry, it still comes to the gigs as well in a carry case. That amp is a keeper , maybe it will be a gig amp, maybe a spare, haven't quite decided. At 4 pounds its the perfect spare amp. I did a quick search on the PV Scorpion 12" speaker, they sell for $100 by themselves ! after taking it all apart, a complete cleaning and a new badge. Love the Emmons badge Tony ! I too have an old Bandit 65 and put a Sica 12" to replace the Scorpion.Great for small gigs or the studio.. I got one for 50.00 a while back. This one is a first or second year version, I think it's 50W not 65W, but otherwise identical. I spent 50 bux on the amp and another 75 on Tolex and grill cloth. LOL.. I've owned several Bandits over the years, they are SERIOUSLY undervalued in the used market place, although I've seen a slight escalation in used prices in the last couple of years. They work great for guitar and steel IMO. nice lookin' amp Bill ! I am not up to date on the heritage of these amps, I just know I owned a couple over the years and always liked them. But then either sold them, gave then away or traded them for something else I probably didn't need. I'll probably use it for a few gigs then start using the other amps again. I think it may be a bad habit I have ! Yeah, I think that look is sort of 'boutique'. I've had more than one guy come up and say "Hey, what kind of amp is that? 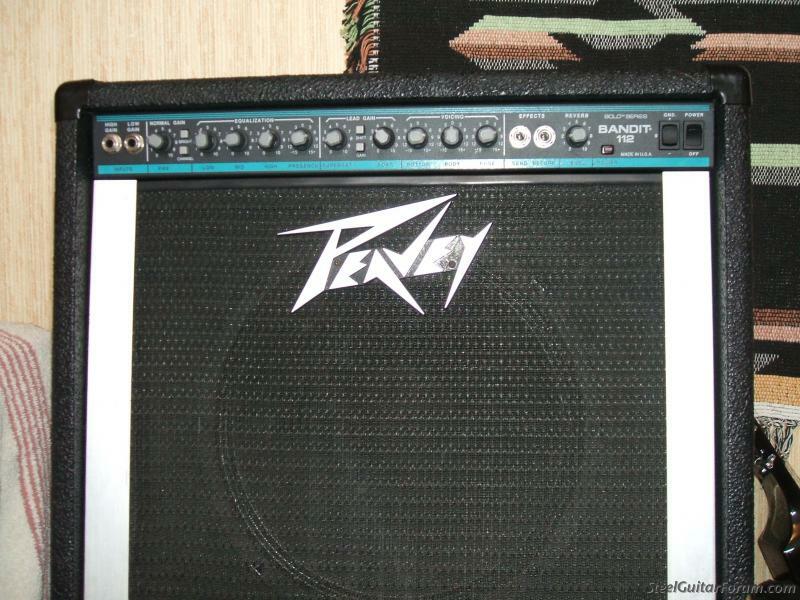 It sounds great.. " Then you tell them it's a Peavey and they look almost disappointed. lol..
Ha! I just finished practicing on mine. Put a Sica 350 watt spkr in it and it is a killer. I use it for 10 string lap steel and tele which I play together at bar gigs I do. For pedal steel it’s pretty good too, but I usually take the Nash400(in Special 130 cab with Neo) or LTD with Neo spkr. I just love my 65. I had to do a sit in with a late night soul/blues band few weeks ago and it just did great. Nice tough sound on lead channel and hit switch for clean channel. Very useful. Didn’t have room for pedals or pedal board of any kind. I paid 50 $ also. 100 still good tho. Btw, check out Kyle Eldridge. He is a Deke Dickerson protege. Monster guitar player. He has access to tons of amps and boutique this and that, but take a wild guess what he drags around? Bandit 65! I got to open a show with him in Vegas festival and asked him why he used an old PV. He just said”Cause it works”! Ha. In Vegas we all just played back line stuff. I’m sure he uses other amps. But there are lots of clips and pics of him with a Bandit 65 with a jbl aluminum cover spkr. I gig with this amp ever weekend. Yes, some ppl look at it funny. I love it. Get a kick out of it. It is a nice sounding amp. Yes I use a delay and couple of preamps to spice it up. For week to week constant playing it is a workhorse. Sica and chip upgrade plus couple of pedals(2 to be exact.) and it is a super working amp. I just don’t have money or patience to keep up with a tube rig, as much as I bang around. Cool to see the old 65 still getting respect! I swear I have A/B’d mine with Nash 400 and LTD and it is really damn close. I think I can hear a bit of the mid frequency that is commonly notched or whatever, but it is still descent. Maybe a certain preamp/midrange classiness is missing on the Bandit 65 for pedal steel but the speaker and chip change smooth out a lot. Would have to use it out in the field on pedal which I have not done yet. My friend Doc gigs with a Studio Pro 60 with a EV 12L in it all the time. Same thing. Yes, not quite big iron, but really good still. More discriminating ears perhaps can hear it more. Most ppl in the crowd wouldn’t know. It’s a great amp just to have for when bigger iron goes to shop and you have a gig. Plus it’s just fun to play smaller amps once in a while. I wouldn’t hesitate to use it for pedal steel if I had to now that it has better speaker. May have advantage for smaller rehearsals/gigs. Can open it up a bit. Not as overpowering. Those big iron amps can really overwhelm sometimes. Special 130 has dual mid control. Put an 8 ohm speaker in it and viola, instant Bandit 85 with sweep mid! I have one of those as well. It’s heavier though. Bandit is still kinda heavy even with Sica. They are just solid all the way. On second A/B I can really say I prefer the Nash and the LTD, but the Bandit is very good. For 50$ it’s excellent! 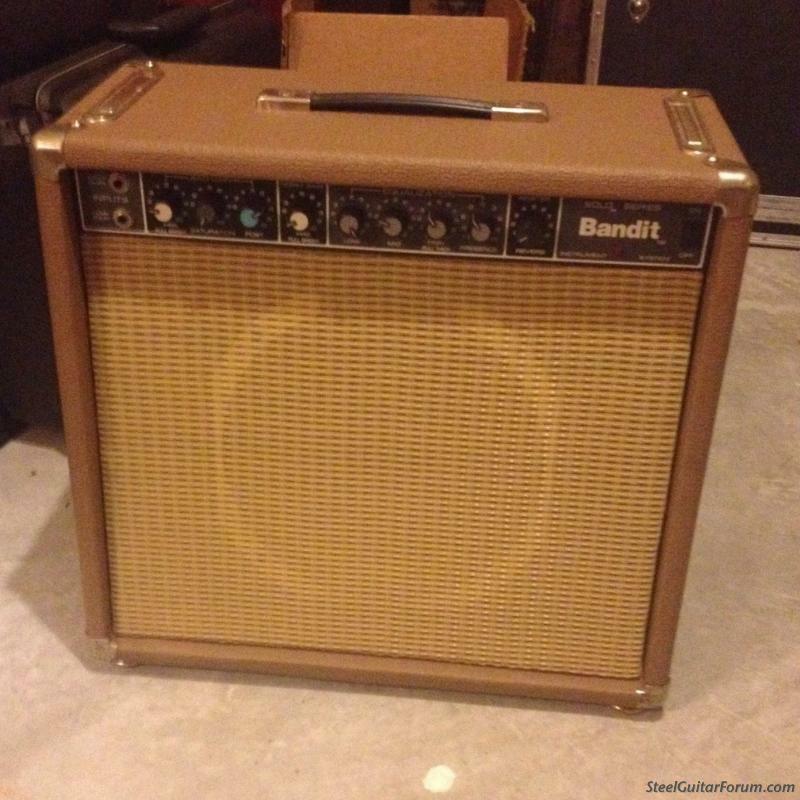 I'm with Tom on the AB, the Bandit is a very nice small amp and while I own many "combo amps", Fenders, Carvins etc, the PV's, including the small Bandit really do have an edge for Steel. The mid shift control, while a very important function on the the PV Steel amps, is not really that much different on the smaller Bandit series where it is not present. As Tom states above, they are not exactly the same but they are damn close. Another consideration is the speaker choice which is really critical for the MID range sweep. My Nashville 112, I pulled the stock speaker and replaced it with a leaning bright EMMI 12" speaker, it changed the entire mid range profile for the better, for me. Thanks for update Tony and Tom, I'll keep my eyes peeled on local Craigslist. I have a couple of Bandits stashed at my sister in laws houses, and they are both great amps. I owned a Bandit 65 in the '80's and thoroughly enjoyed playing through it. I now play through the Classic 30 and Classic 100's for larger gigs. Can't beat them. I picked one up on Craig's list locally for $40. The cabinet is in pretty poor shape but it works well. This winter I'll build a new cabinet for it. It will be a fun and rewarding project. I can't say if all the Bandit series are the same, some are based on the same platform, some are not. The earlier Bandits with the Aluminum grill edges appear to be the same platform. 3 knobs for the channel switching, 1 clean gain knob and 4 knobs for the EQ section. Plus reverb. Pretty simplistic. Effects send and return at the rear plus a foot switch jack. I used the Bandit 65 last night, a fine Steel playing friend from Nashville was in the room visiting. After the show he came up and told me he thought I was playing thru a Nashville 400 ! The mid range was no issue what so ever and I did use the channel switch between Guitar and Steel, very slight drive. I added a cabinet mounted ext speaker jack so I could plug in the 2nd cabinet cross the room, total of 4 ohms load. This amp will most likely get the call for the road trip every other Thursday for my regular duty , DOUBLE DUTY gig. To my ears at the low to moderate volume it sounds like a Nashville 400 behind me for the Steel while the Telecaster had it's own sound separate from the Steel, not like a Fender tube amp, but certainly more than acceptable. 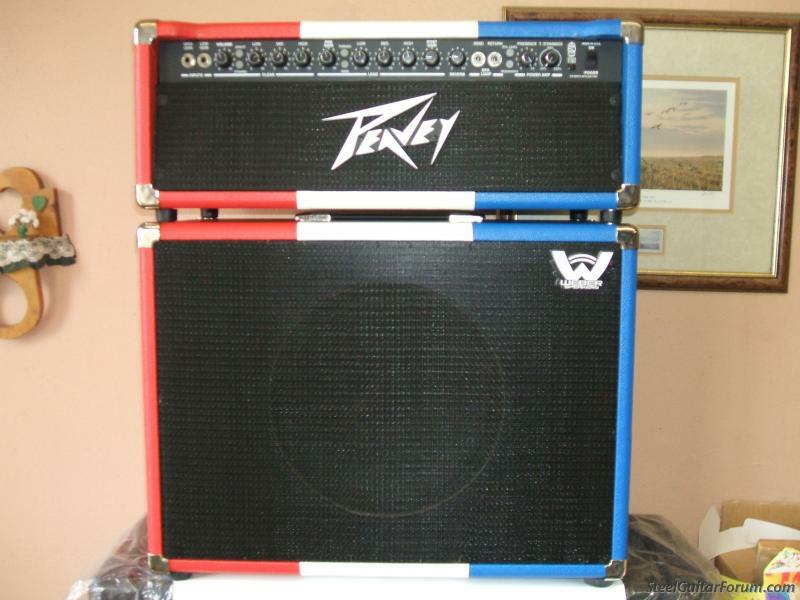 This is a very CLEAN amp. PV had it down with this amp thats for sure. Maybe they didn't know what they had ! I forgot just how good these amps are and what a bargain they are . 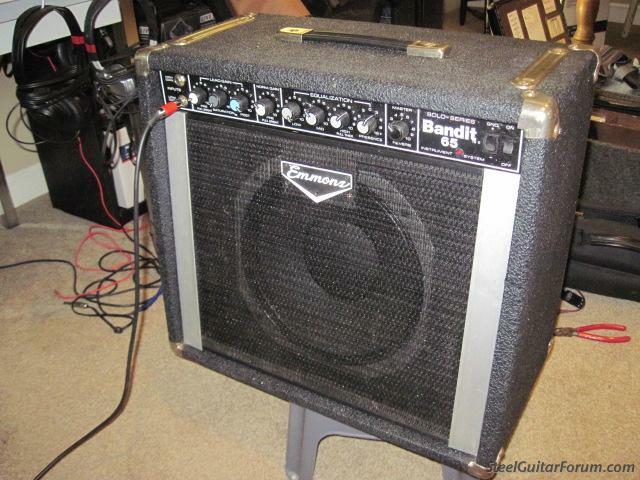 Tony did you know the Bandit-65 amp is the same size of the NV-400 Cabinet. I had a extra NV-400 Cab. so I put the Bandit amp in the NV-400 Cab with a 15"JBL D-130 8 Ohms speaker. Did not help any on the weight but has a killer sound. I recently picked up a old used first generation Studio Pro 40 off of CL. It is basically a lower powered Bandit. The ad said that the pots are noisy, the volume jumps around, etc. For $25, I'll gamble. After cleaning it up, it works fine. So fine in fact, that for 6 string I was SHOCKED by how good this 30-40 year old thing sounded. I was going to give it to someone as a present, but started having serious second thoughts. Not knowing when to leave well enough alone, I hopped back on CL after a couple of days. Cleaned it up, listened to them both, sounded the same. The SP40 is going to a friend as a present, the SP50 is staying here as a grab and go amp. Once again, I was not expecting these amps to sound this good. If you are a guitar player, you need a deal like this as a back up just like you need strings and cords. With an extension speaker jack, or micing it, this could also be a back up steel or even a bass amp in a pinch. Granted, there aren't many rockers here on the SGF. But this is the best video I've found that shows what these SP and Bandit amps are capable of. I have seen that video! Love that guy. Been wanting a Studio Pro. I just finished a 2 night gig at a biker bar out in the country and played the Bandit 65 for both 10 string lap steel and tele. Damn that little amp can rock! I am using the lead channel instead of normal with is the opposite of what I would do if just playing pedal steel. I like lead channel so I can tame the volume, fine tune it a bit. God it’s loud. Steel breaks up just a bit witch I am not crazy about but it kind of lends itself to the old swing and such. Hard to find happy medium. Steel likes clean, tele likes grit. Can really get good mix of both so each are fairly clean but have edge like old swing records. The Sica speaker really helps a lot. I really had great time playing this amp. I use an EP booster and Sarno drive for steel and an MXR echoplex preamp into a Carbon Copy delay. That’s it. The Ep and mxr to color sound a bit plus nice to have some volume control.they both go into the 2 inputs of the Bandit. Lot to ask for from one amp. Just got this setup down finally after trying half a dozen combinations. Man I can’t tell you how much I just plain enjoy this amp. I play it with bright switch out also. Kyle Eldridge got me on that. Do you guys use that? Tony, do you have an amplifier museum? I would love to drive down a spend the afternoon taking pictures if it is open to the public! All of those old Peav's sound great with an RV3 or other Stereo effects. Two of any of these old Peavey's in Stereo makes for a nice gigging rig. Not yet but apparently I'm working on it ! I keep selling them, only to get more. I'm at an all time low right now, 1 N400, 1 N112, and 1 Bandit65. Ha! I have. Session 400, LTD 400, Nash 400, Special 130, Bandit 65 and 2 Pacers. It is a habit I think. Wish I had a Studio pro or maybe some tube models. No more room! Come on Tom, there always room for one more ! I made a change to the Bandit 65 Foot Switch jack. I pulled the dual jack ( reverb and channel switching) and replaced it with a single jack. The reverb is on 100% of the time now and the single foot switch jack is for channel switch only. It just seems much more convenient to have a single foot switch. Plus the one I'm using is about 1/3 the size of a dual foot switch assembly and fits in my seat no issues. Yeah I know I could have used the same dual jack and rewired it for the LONG tip to be for channel switching, , but I didn't ! I have a bag full of single jacks, I needed to use one . Why do we even have a foot switch to turn reverb on and off ? When was the last time we turned it off ?